Nothing pains me more than suffering dogs. I love them with a passion, my dog, your dog, anyones dog! For me they are the animal de jour and I want the best for ALL of them the world over. 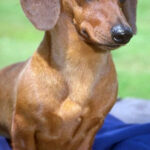 With that said, my mission is to help you to help your dog live a life of rich experience, love, fun and boundaries. If your not sure on the boundaries part, this is where a dogs world is framed by what he or she can and cannot do which helps them to understand exactly how they fit into your world…a bit like kids! This is to ensure your dog is happy in the knowledge that he or she knows where they stand and can relax in that knowledge. In this article, it’s the nutrition part that takes center stage and it’s key to your dog having a rich experience of life or a dismal one and depending on how much you value your canine friend, has a huge effect on the richness of your experience with your pet. A lot of dogs suffer with allergies, possibly up to 75%! It’s one of my biggest email requests for help to solve the problems which can be many and varied. Itches in certain places that appear normal but cause your dog to attend to them by licking, scratching, pawing, otherwise known as hot spots. Build up of waxy, dirty, orange/yellow/brown gunk in the ear canals up into the parts you can easily see. ALWAYS give your dog filtered water to drink—>ALWAYS! (NEVER, ever, ever, ever, tap water). Bottled, rain, creek (if it’s clean) water will do too. Simply put in a very non professional way, tap water is crap. It’s toxic and full of chemicals, all flowing into your beautiful dogs body to do untold damage over time. I’m not going to go into the why’s and wherefores, I’ll let Collen M over at Renegade Health explain one good reason why you will be watering your dog differently from this day on. Though there is a lot of conflicting information out there, one thing we’ve learned is that just because it’s on the shelf doesn’t mean it’s good for our dogs. In 2009, for instance, the Environmental Working Group (EWG) found through independent laboratory testing that eight major nutritional brands of dog food contained high levels of fluoride, a contaminant that can put dogs’ health at risk. The amounts ranged between 1.6 and 2.5 times higher than that recommended by the Environmental Protection Agency as the maximum legal dose in drinking water. Scientists don’t yet know how much fluoride is safe for dogs to consume, but they have found that excess fluoride in people can cause weakened bones and increase risk of fractures. 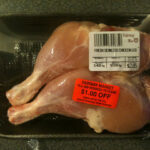 The chemical is also linked with hormonal disruption and neurotoxicity, and potentially to bone cancer….More at What’s the Best Diet for My Dog? 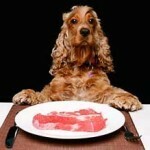 Should I Try a Raw Dog Food Diet? I hope that article helps you to understand my point above about giving your dog the right water to drink. 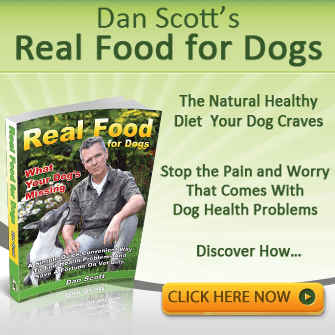 If you want to understand more about raw natural dog food, get my free report below. Anf if you are ready to switch your dog to a simple raw food diet that is as un-complicated as possible and will have HUGE beneficial impact on your dogs health plus END allergies period—>Click Here. 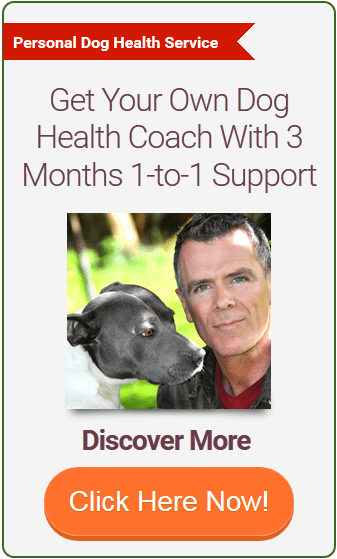 Here’s what a balanced, enzyme rich raw food diet does – I Love Dogs! The pet food industry has denied the rumors for years. Yet the reports just keep coming. They claim a number of companies continue to use euthanized pets to make dog food. Sound impossible? Watch this I watched a short video and decided for yourself that I was going to stop buying / boycott dry packaged pet food. And if what I saw in this video is true, man, what a travesty it is. Hi Edward, unfortunately it has been true in the past and could well be practiced today – disgusting I agree. All the more reason to take control of our dogs diet and so simple to do once you pick up the bascics – that’s why i’m here. Thanks for sharing your thoughts. I wish I would have known this before my dog passed away, I think this is something he lived with miserably for years because I had no idea it could be the case. I have two dogs now that I watch very carefully for the signs because I want them to live long happy lives in comfort not miserable. Thank you for posting this it Is very helpful. I had no idea that a dry cracked nose was a sign of an allergy because in a pug their noses get dry and crack like that when they’re getting up there in age, when does it start happening if they have an allergy? This is a good post to print and keep handy because I have two dogs that I don’t want to have allergies so I watch for the signs all the time. 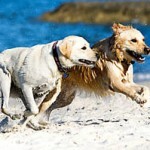 Skin allergies are rife in dogs. As the skin is an organ and furthest away from the more delicate internal organs, the allergies are sent to the skin to deal with first only moving deeper into the body when a solution cannot be found by the dogs cetral defence mechanism – the immune system. A dry cracked nose is just one outward sign that diet change is needed, not some topical opintment or drug. We must fix the underlying problem as a permanent solution, short fixes just delay the inevitable. No problem Edward, sorry to hear about your last dog. I’m sure your present best friends will benefit from your wisdom and be very happy and healthy for it.